Photoshop Elements enables you to select a foreground or background color by selecting a color on the Color Swatches panel. The Color Swatches panel is a digital version of the artist’s paint palette. In addition to preset colors, you can mix and store your own colors for use now and later. You can have palettes for certain types of projects or images. For example, you may want a palette of skin tones for retouching portraits. Choose Window→Color Swatches to bring up the panel, as shown in the figure. To grab a color from the Color Swatches panel, click the color swatch you want. By the way, it doesn’t matter which tool you have. As soon as you move the tool over the panel, it temporarily converts to an eyedropper that samples the color and makes it your new foreground or background color. Change the background color. Either first click the background swatch on the Tools panel or Ctrl-click (Cmd-click on the Mac) a swatch in the Color Swatches panel. Use preset colors. 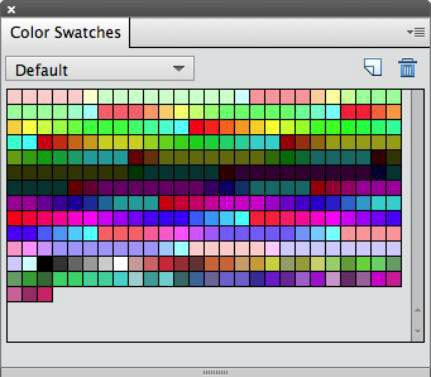 To load a particular preset swatch library, select it from the drop-down menu at the top of the Color Swatches panel. Elements offers libraries specific to web graphics, photo filters, and Windows and OS X systems. Add a color to the Color Swatches panel. Choose New Swatch from the panel menu. You can also simply click an empty portion of the panel. Name your swatch and click OK. Remember, it doesn’t matter whether you created the color by using the Color Picker or sampling with Eyedropper tool — adding the color for later use is done the same way. Save swatches. Choose Save Swatches from the panel menu in the upper-right corner of the panel. Save the swatch library in the default Color Swatches folder in the Presets folder. If by chance this folder doesn’t come up by default, just navigate to the Color Swatches folder by following this partial path: AdobePhotoshop Elements 12.0PresetsColor Swatches (Windows) or Adobe/Adobe Photoshop Elements 12/Presets/Color Swatches (Mac). Save swatches for Exchange. Choose this command from the panel menu to save your swatches for use in another Adobe program. Name the swatch set and save it in the same folder listed in the previous list item. You can also work with swatches by using the Preset Manager. Delete swatches. To delete a swatch, drag it to the trash icon at the bottom of the panel or Alt-click (Option-click on the Mac) the swatch. Change the panel’s appearance. Click the panel menu in the upper-right corner to choose Small or Large Thumbnail (swatch squares) or Small or Large List (swatch squares with a name).